Our new farm fresh Oaxaca (pronounced ‘wah-hah-cah’) is a Mexican-style string cheese, made from ribbons of fresh buffalo milk cheese wound into balls by hand. Nicknamed “the mozzarella of Mexico”, legend has it Dominican monks originally created the popular cheese in Oaxaca, a state in southern Mexico. While the process is similar to making mozzarella, the moisture content and texture of the cheese are quite different. Oaxaca is designed to be shredded into strings, and with its superior melting properties, it’s perfect for topping your favourite Mexican meal. The new cherry buffalo mozzarella is here! Presented in brine, these tasty mini morsels of cheese are made from fresh buffalo milk, free of preservatives and are dispatched on the same day they’re manufactured. The cherry buffalo mozzarella are ideal for adding a simple, but exquisite touch to a meal - check our our recipes page for more great meal ideas using our products. Our farm fresh, handmade Marinated Buffalo Cheese is here. A delectable combination of flavours perfect for use in salads, pasta or vegetables. Lightly salted and marinated in thyme, roasted garlic and olive oil, the cheese is also stunning spread on bruschetta or crackers. Just south of Auckland on the shores of the Hauraki Gulf is a farm unlike any other in New Zealand. True pioneers of the buffalo farming scene locally, Richard and Helen Dorresteyn own and operate 200 head of buffalo and were the first to farm buffalo in New Zealand in 2007. We are a family-run business, and collectively produce award-winning fresh buffalo mozzarella, bocconcini, ricotta, yoghurt and marinated buffalo cheese. We are proud to have won multiple awards and gold medals at New Zealand’s national cheese and artisan awards. 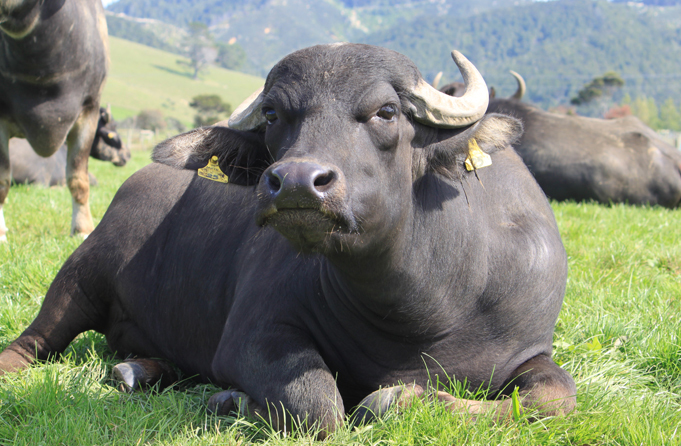 Our Clevedon Buffalo Co. Cheeses & Yoghurts are made with farm fresh milk from our herd of Riverine water buffalo which graze freely on lush open pasture in Clevedon. Buffalo milk contains 58% more calcium, 40% more protein and 43% less cholesterol than cow’s milk. Buffalo is a popular alternative for those who suffer from CMA (cow’s milk allergy).